Starting September 18, Freshdesk will no longer be the center of Interfolio help resources for Faculty180. Instead of linking to Freshdesk from the Faculty180 product, users will be directed towards product-help.interfolio.com to view any Interfolio-provided help resources. We are being mindful of this communication as to not disrupt the workflow of any institutions. The primary change that users will notice is the "Knowledge Base" link in the 'User Name' menu in the top right corner of F180 will now direct users to product-help.interfolio.com instead of linking them to Freshdesk. Also, users will have to navigate to the site in order to submit a ticket, instead of being able to submit a ticket from within the Faculty180 application. While on product-help.interfolio.com, administrators will be able to submit tickets to the Interfolio team and submit requests or questions as they had previously. The migration will begin on Saturday, September 16th and finish by Monday, September 18th. If there are any questions about this migration, please submit a ticket in Freshdesk or an email to the Interfolio administrator for your institution. There is now more flexibility in the setting of permissions for “Add/Edit Faculty” Option. We’ve broken out separate permissions for admin users to control “Add Faculty” and “Edit Faculty” in AdminSetup Organizational Structure section. Because the old “Add/Edit Faculty” option, in-error, prohibited adding but not editing, the new default behavior for clients who had “Add/Edit Faculty” set to No Access Granted will be to set “Add Faculty” to No Access Granted and “Edit Faculty” to Allow Access Only. If “Add/Edit Faculty” had another setting, that setting will be replicated for both “Add Faculty” and “Edit Faculty”. There is a new option, to remove any Courses Taught for a term/set of terms that are not present in the latest bulk upload for those term(s). 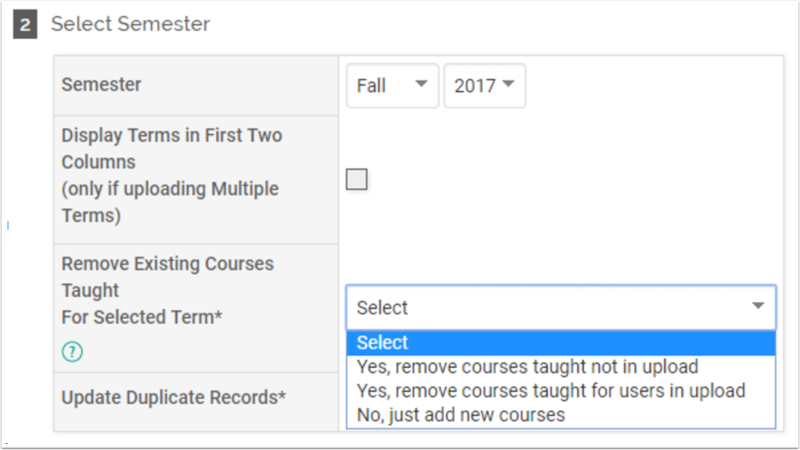 If an institution wants to ‘update’ courses taught they loaded previously, but data points have changed (instructor, enrollment, etc) this option will allow them to do just that, assuming the newly uploaded courses taught have the same prefix/number/section and all relevant attachments and activity classifications. The feature will work whether “Display Terms in First Two Columns” is checked or not. If it is checked, any courses that are not in the upload for the terms present in the upload will be removed. If it is not checked, any courses that are not in the upload for the selected term will be removed. In the long term, we encourage our clients to use our API for managing courses taught. - In order to increase usability of the product for our users, the sections in an initiated input form should now remember whether they were collapsed or expanded or if a user takes an action in the form, like adding a new activity. - When a user is adding a Scholarly Contribution to the Activity Input form, a filter box now exists for Scholarly Contributions so users can see if they have previously entered a scholarly work. - SACS Faculty Roster part-time faculty export now updates fields according to user selections. The word ‘with’ was appended to the list of collaborators for each grant entry assuming that there would be more than one collaborator listed each time. That assumption has been corrected and the word ‘with’ removed. Date range will now not show on evaluation vitas when it is configured not to show on the vita template. All Search boxes in Faculty180 have moved to the left side of the screen, rather than the right.This will affect the Dashboard/To-Dos, the Vitas & Biosketches menu, report outputs, and other areas where the Search box appears. We are currently planning for a small release on Wednesday, September 6, that will ‘lock’ the underlying data on the vita when it is set to lock during the evaluation set up. This means that users of the “View Complete Record” (spyglass) option on a locked vita will only see activity data as it existed upon locking, including attachments. *The fix will apply only to vitas that are locked after the release*. Unfortunately, there is no good way to retroactively lock old evaluation vitas. Quicklinks during emulation are returning. This involves some small modifications to the main user menu in the top-right. Despite the wonderful teaching comments by some faculty members, they will no longer be replicated and needlessly repeated over multiple terms on their Vita. When scholarly contributions are grouped by activity classification (AC), the works that do not have the selected AC will no longer disappear from the vita.